They say that change is as good as a holiday, and so after more than 20 years of making the same granola recipe I decided to change things, but only slightly. This Toasted Muesli is the result! Dave and I are really creatures of habit when it comes to breakfast. Every morning when we arrive at work, Dave makes coffee and dishes himself up a bowl of the toasted muesli. I drink my coffee before even thinking about food, and then start my day with fruit – usually 2 small apples. Over the weekends and when we are on holiday, breakfast consists of eggs and on the odd occasion, oats. And I will only eat the oats if they are made with a tot of whisky, a good knob of butter and sweetened with honey. For my muesli I have added cacao nibs for that slight chocolate taste and cranberries and goji berries for colour. The nicest thing with my muesli recipe is that you can change it to suit your own tastes and you can add more nuts, take away some of the dried fruit or even use coconut oil. This is all entirely up to you. Make sure you keep it stored in an airtight container, and like with my granola recipe, you can add a cinnamon quill to the container to add an extra flavour note, however slight it might be. What do you eat for breakfast during the work week? This toasted muesli is the most tasty way to start your day. I have never made muesli…but enjoy when added to yogurt…thanks for the recipe Tandy! This looks delicious, Tandy! LOVE homemade muesli and granola. Always taste 100x better than shop bought! I want to make a muesli this week but just want the weather to cool down before turning the oven on. It’s so hot here! BTW the muesli looks fantastic! Thanks Lorraine, and I see you are having very hot weather! I LOVE muesli, but am especially obsessed that this one is toasted and with goji berries! I love muesli and it is so great as cereal or with yogurt. Love the fruit and cacao nibs! There is nothing wrong with a good cereal Kay! This looks very good muesli – Tandy – I seldom eat the same thing for breakfast two mornings running – my breakfast can run from fruit, muesli & yogurt, eggs on toast, avo & feta on toast, just toast and butter, or even last night’s leftovers (that’s not usual – cos I usually have those for lunch!). So no set pattern there – I just take each morning as it comes. That really is a lovely way to start the day. The cinnamon flavour sounds wonderful! 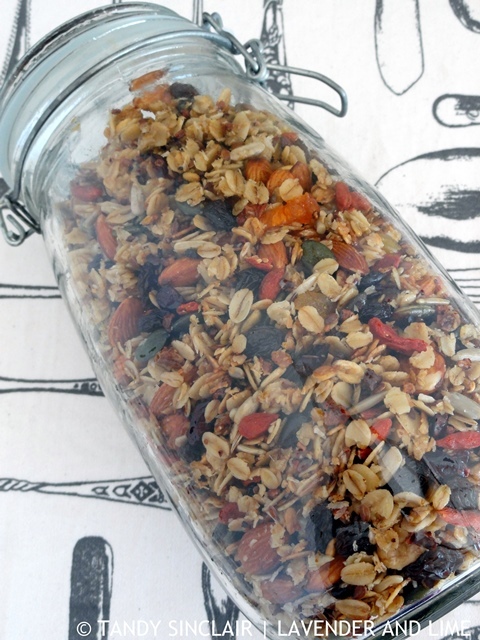 I just recently made granola for the first time, and I think this muesli is going to be next! Love all the dried fruit mixed in. I love all the tasty ingredients in this wonderful mix. What a great idea for breakfast! I have scrambled eggs, bacon and something orange juice every morning….almost never vary. What a great mid-morning snack too!